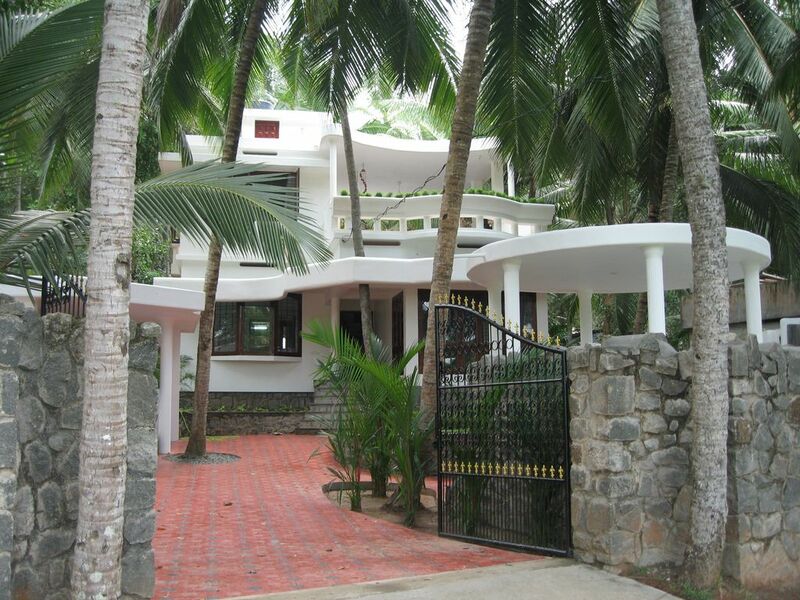 A villa to appeal to those wishing to see the rural Indian way of life away from the hustle and bustle of the coastal tourist town yet still within reach of excellent sandy beaches and the facilities of Kovalam Beach. Stroll around the lake and watch the villagers of the Village KATTUKULAM bathing in the lake, watering their animals and preparing their small fishing canoes for the next day. See the production of reed mats used to make the simple houses of the poorer villagers. See the tree climbers harvesting coconuts. The accommodation comprises a spacious lounge with well equipped kitchen. There are three double bedrooms with en-suite bathrooms. There is a large roof terrace with hammocks and swinging chairs. The lush garden has spacious white marbled terraces with reclining wooden chairs surrounding the pool which is itself sheltered from falling coconuts! The Villa can be boocked completly or the two Units can be boocked seperatly. it is next to the Vellayani Lake and still close to the famous Beach Side Resort of KOVALAM BEACH only 10 Minutes Distance by Car. All walls and floors marble. Modern western style fittings. Welcome pack of tea, coffee, milk, water, bread, butter and marmalade,fruitbasket Local gardener and pool maintenance included. This property is an excellent choice, should you wish to be close enough to a resort to enjoy its amenities, whilst experiencing the wonders of Indian village life. Set in a stunning area in a rural part of Kovalam only a 10 minute tuktuk ride from the beach, this really is a beautiful property. It's spacious, clean and well equipped, it's views and surroundings are lush. We loved the roof top terrace, where we overlooked the village, watching the wonderful array of birds and wildlife, as well as enjoying observing the locals going ahead with everyday life. It was a joy to meet the local children, who entrerained us with their antics. It would be hard to experience this if you are just in a hotel in a resort. Taxis, tuktuks, cars and drivers can be all arranged by Annita, who lives close by and who kindly cares for the villa. Annita and her lovely family were truly a blessing, nothing was too much for them, she maintains the villa and its gardens beautifully and we are truly grateful for all their hard work during our stay. We would be more than happy to recommend this villa to anyone, especially those who enjoy bird watching as the lake is a short walk away and birds are plentiful. It makes a wonderful base, and we were able to explore more of Kerala from here. Thank you Willie and family, for allowing us to share such an incredible experience. We loved every minute. thanks fore your review.we indeed do all we can to ensure a pleasent and relaxing holiday to our guests.and we are verry happy to recieve responses like this,which motivates us to continue with our efforts. I really don't quite know where to start. First things first...we slightly changed our travel plans and arrived a day early in Kovalam, not sure whether we would have to take a hotel for the night. I omitted to take the owner's telephone number with me to India and so we just turned up at the door step. We immediately were made to feel really welcome by Willi, Molly and Leo and allowed to start our stay early. The owner and his family could not have been nicer and this set us off to a really good start. The villa and its surroundings are absolutely breathtaking. Beautifully maintained grounds, lush palm trees and plants and the immaculately maintained house made this an exuberantly luxurious stay which left nothing at all to be desired for. Walk a couple of minutes and you find yourself directly on the lake, which in itself is stunningly beautiful and invites for silent contemplation during a relaxing walk. Even though Willi and his family were close by, they were so discreet that we hardly noticed them at all, yet always to hand and happy to help when we needed them. They are a lovely family and had some great recommendations for us in relation to eating out, sights and trips. There are so many other things worth mentioning that made this the perfect holiday... the stunning veranda, the pool, the lofty spaces in the villa, Spikey the dog, and so much more. Renting this villa for the two weeks we stayed there was worth every penny and we can wholeheartedly recommend this as a perfect place to stay, when visiting Kovalam or its surrounding areas. One last thing to mention is that it took us a little time to find the villa, despite the owner having giving us detailed instructions on how to get there. Google maps and rikshaw drivers eventually pointed us in the right direction. VELLAYANI LAKE and KATTUKULAM have been the words that helped us to arrive. thanks fore your review.we are glad that you enjoyed your stay with us and hope to welcome you again another time. Villa is clean and comfortable with 3 double bedrooms and 3 ensuite bathrooms small plunge pool and an excellent roof terrace with chairs and hammocks. villa is rural but there are a few local shops that sell water milk etc, main supermarket is 10-15 mins away by taxi 300-400 ruppee. beaches and restuarants are 15 mins by taxi or tuk tuk 200-300 ruppee each way. Jose and the onsite family look after the property and will book taxis tuk tuks for you and supply all the local info. lighthouse beach is fantastic with a variety of restuarants. also worth a trip is Valkara beach and a house boat stay on the kerela backwaters,we booked through Taj who has a travel agent next to rock cafe in lighthouse beach,he arranged taxi to take us the 4 hour journey to a 3 bed house boat on the backwaters food was excellent. A superb house in a lovely out of the way area. Much appreciated were the sun terrace and swimming pool. The nearby lakes are glorious with some excellent walks. We were well cared for by Jose and family. The welcome pack (including Kingfisher beer!) was very extensive and much appreciated. The house is off the tourist track but auto rickshaws are readily available. Be aware that February is religious festival time and the local temple is very noisy. This was our second visit to Kerala and it really is wonderful. i spend with my family a relaxing holiday.the housekeeper jose is a verry friendly and helpful young men which helped us to enjoy our stay at this beautiful new villa.in the evenings we enjoyed to walke along the lake and watch the fisherman and lokal people at the seashore.this home is away from the touristik hustle and at the same time only 15 min drive away from the famous seaside-resort of covalam beach. we can just recommend it !!!!!!! and we will come again fore shure!!!! The villa is located 100m from the freshwater VELLAYANI LAKE and in front of a coconut tree plantation. The surroundings are typical rural India with sparse locally inhabited houses around and the nearest village some 3km away. the two Units can be boocked seperatly ,or the Villa completly. The famous seaside resort of Kovalam Beach is 8 km distance; 10 minutes by car. There are local shops and an everyday fish market. At Kovalam beach are many excellent shops and restaurants.